The survivability of a warship is its ability to remain operational in a hostile environment. It is the protector of both life and property, yet it is often a low-prioritised aspect of the design. It can be an attribute fitted on an existing vessel, but the most efficient solutions are integrated in the early stages of design. SSPA has participated in numerous projects and have gained significant experience in survivability design. Survivability can be expressed as the combined effect of susceptibility, vulnerability and recoverability, or in other word the abilities to remain concealed and avoid being hit, to resist damage when hit, and to recover damaged functions after being hit. The aim of the survivability design is to combine these abilities to provide a high degree of survivability with as little negative impact as possible on other critical aspects of the design such as weight, cost or accessibility of the vessel. The methods to achieve a high degree of survivability are developed for naval vessels, but the same principles should be applicable when fitting a commercial vessel to withstand pirate attacks. From a systems and personnel safety point of view, the most desirable solution for achieving a high degree of survivability is not being fired upon, and if being fired upon, not being hit. These two aspects of survivability are grouped under the term “susceptibility”. Susceptibility thus includes all measures taken so that the adversary is denied the possibility to launch or fire a weapon at our vessel and a fired weapon does not hit our vessel. When discussing both of these aspects, the signature level of the vessel in combination with various support systems (jammers, decoys, distraction systems) and the tactical use of the vessel and support systems are critical to maximising the likelihood of not being hit. By using subcontractors, SSPA may also be able to provide support in the area of magnetic and underwater electric signatures – underwater electric potential (UEP) and extreme low frequency electric (ELFE). In the specific areas regarding acoustic noise and radar cross section, SSPA can claim to have world-class capabilities. In 2011 the Swedish Defence Materiel Administration (FMV) initiated a study on vulnerability, supported by the Swedish Defence Agency (FOI) and SSPA. The aim of the study was to develop a methodology, with the purpose of describing how vulnerability should be handled in future design projects. The outcome of the project was a handbook on vulnerability reduction, which includes but is not limited to methods for writing requirements and validating them, how to use systems engineering in vulnerability reduction design, and gathering known vulnerability measures in a database. Vulnerability reducing measures are categorised into a number of principles: redundancy, separation, concentration, equipment hardening, protection, capacity and damage containment. Each principle contain a number of measures such as blast bulkheads, shock mounts, fragmentation protection, and CBRN (chemical, biological, radiological and nuclear). However, apart from a few best practices such as separating independent redundant systems and concentrating stand-alone systems, a number of factors need to be considered before introducing any vulnerability reducing measures in the design. These factors include weight and cost constraints for the vessel, the size of the vessel, and the environment in which the vessel should operate, etc. Yet even with these parameters known, there is a need to balance vulnerability reducing measures against susceptibility and recoverability measures in order to find the most efficient solution. One of SSPA’s main contributions to the project was to develop a systematic method to find the most efficient solution within the given constraints. to validate and document that the suggested solution meets the requirements or suggest modifications to the requirement. It’s a common misunderstanding that vulnerability is easily fitted to an existing vessel. It is actually the opposite, since many of the most efficient vulnerability measures include placement of equipment, systems and structural elements. These measures may have a great impact on the overall design of the vessel, making it a success factor if the vulnerability design can be carried out in parallel to the overall design of the vessel. With that said, making an existing vessel less vulnerable should not be neglected, as much can still be done, regardless of whether it relates to a naval vessel undergoing a upgrade or preparing a cargo vessel for a hostile environment. Recoverability is the vessel´s ability to retain damaged functions after being hit. The fundamental function for a high degree of recoverability is the damage control teams. The designer´s primary task in terms of recoverability is to make efficient damage control possible by introducing fire zones, watertight boundaries, fire insulation, and to minimise use of combustible materials, etc. Another important aspect is to develop decision support plans. SSPA has developed damage information plans, DIPs, for naval vessels. The DIP is posted on the bridge and in the damage control centre of the vessel. It gives an overall picture of how critical weapon-induced damage can be dependent on the magnitude of the damage and the location of the hit. It includes detailed information about stability and floating position of the vessel and describes the impact on key systems and abilities post-hit. Altogether, the DIP provides the master with prompt information about the vessel´s condition in order to make sound decisions following the critical events of having suffered weaponinduced damage. 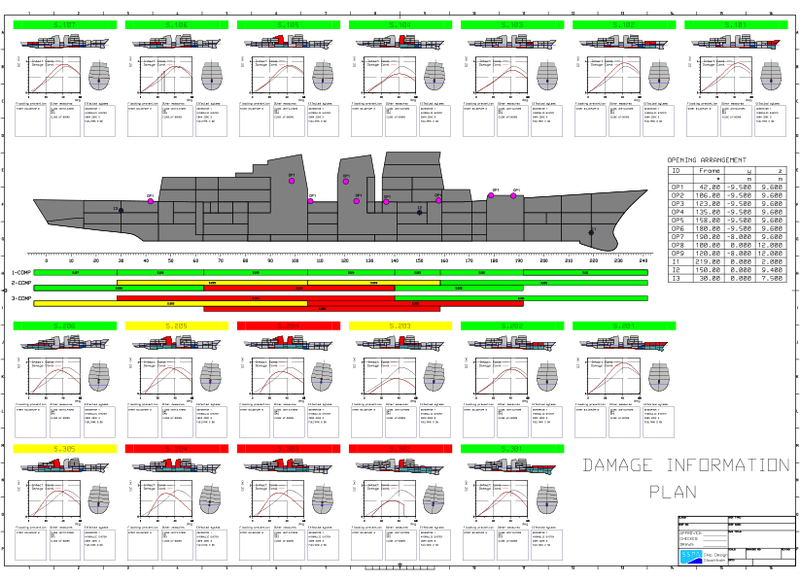 The Damage Information Plan gives an overview of the vessel’s condition after being hit.